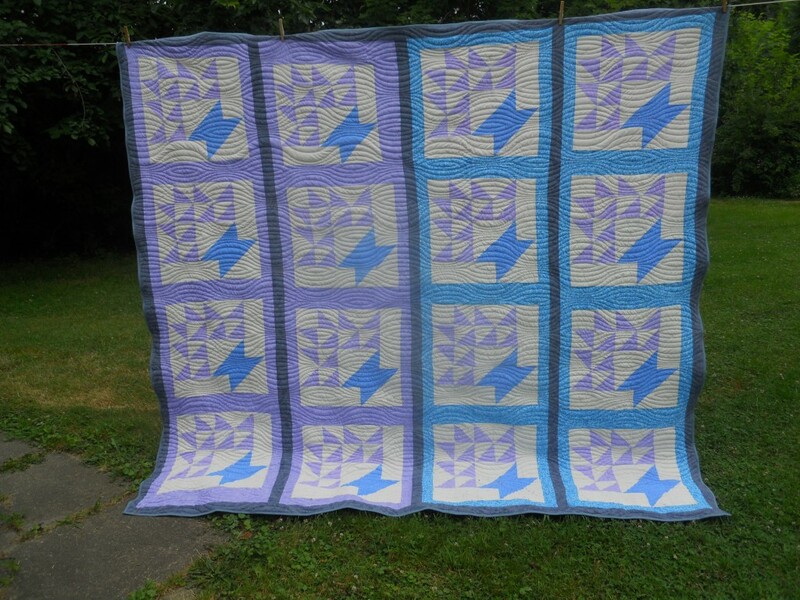 Here’s another charity quilt that was completed this month. 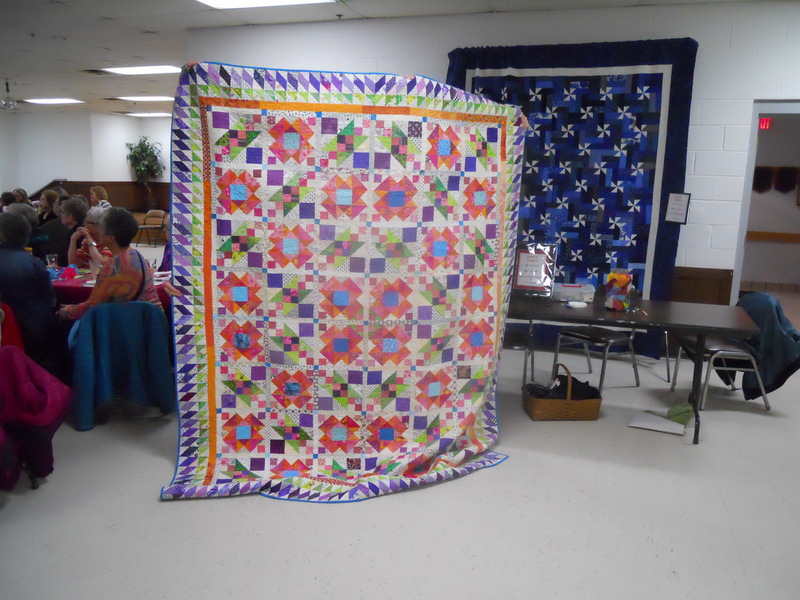 It’s a “cheater” panel quilt that was donated to the guild. It measures 35″ x 44″. 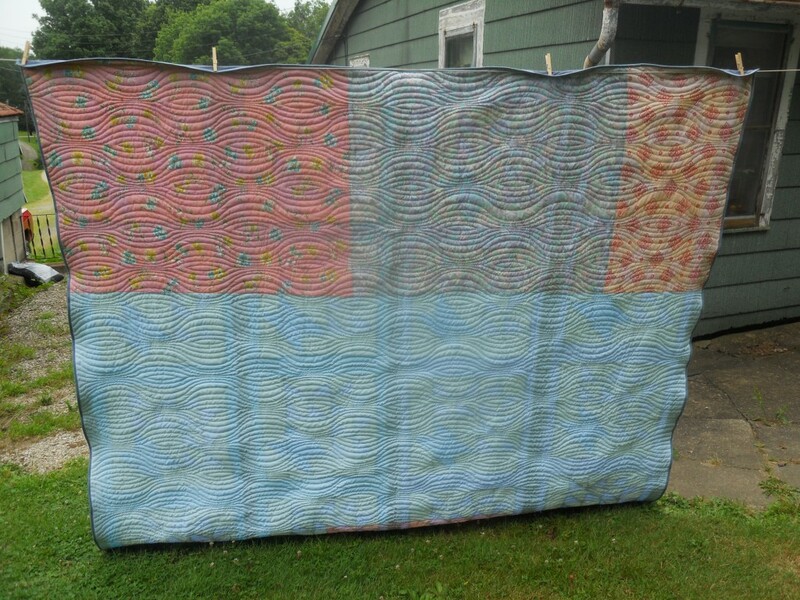 It was longarm quilted with a clam shell design. Glad someone made more labels! Here’s the back. 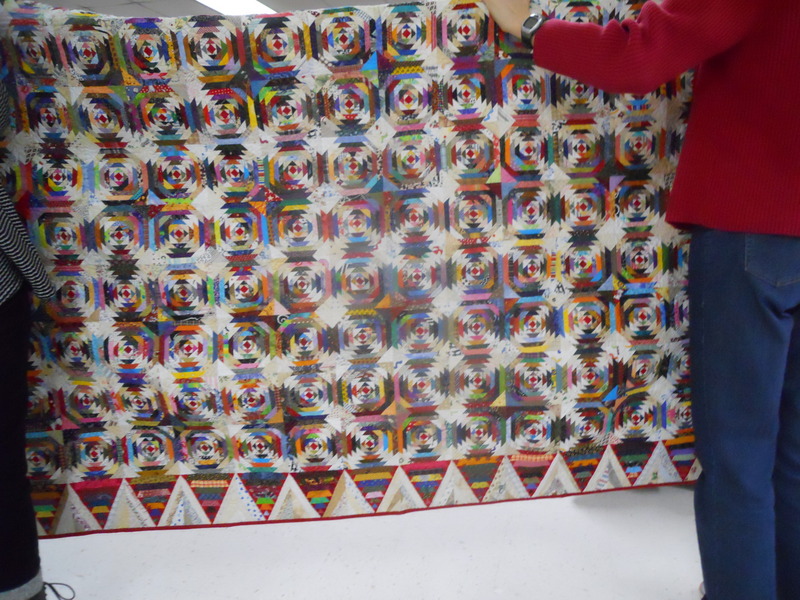 Sue thought this big print would look good on a kid’s quilt. She was right! Welcome to Scrap Saturday. 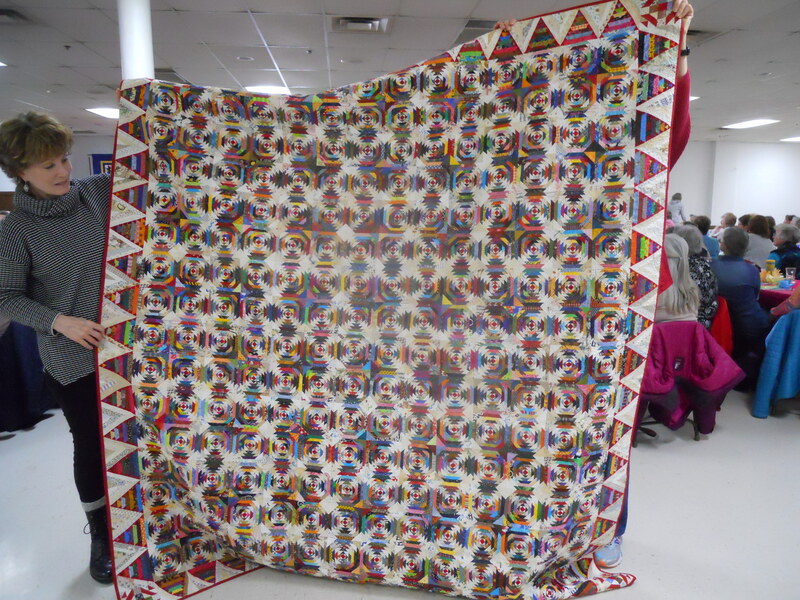 Today is FIELD TRIP day to the United Quilt Guild Quilt Show in Salem. Check back next week to view some photos. 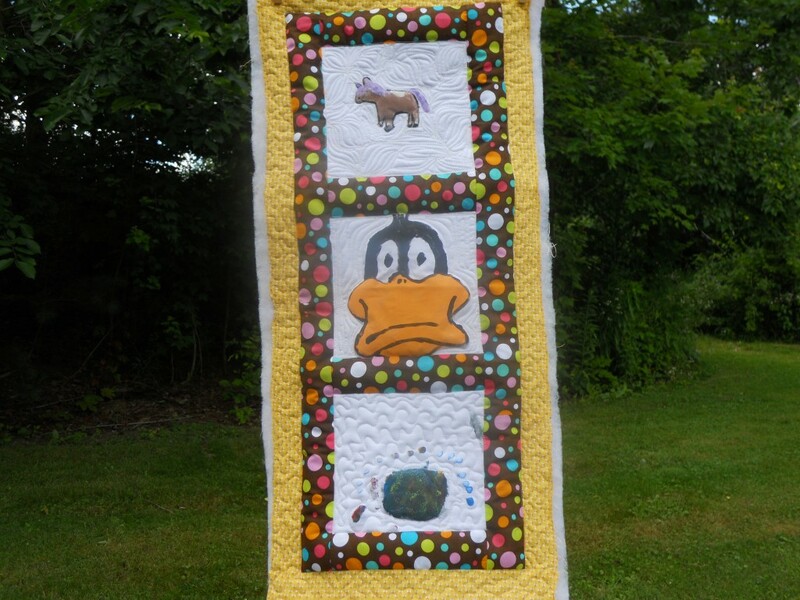 For today take a look at the cute charity crib quilt finished this week. 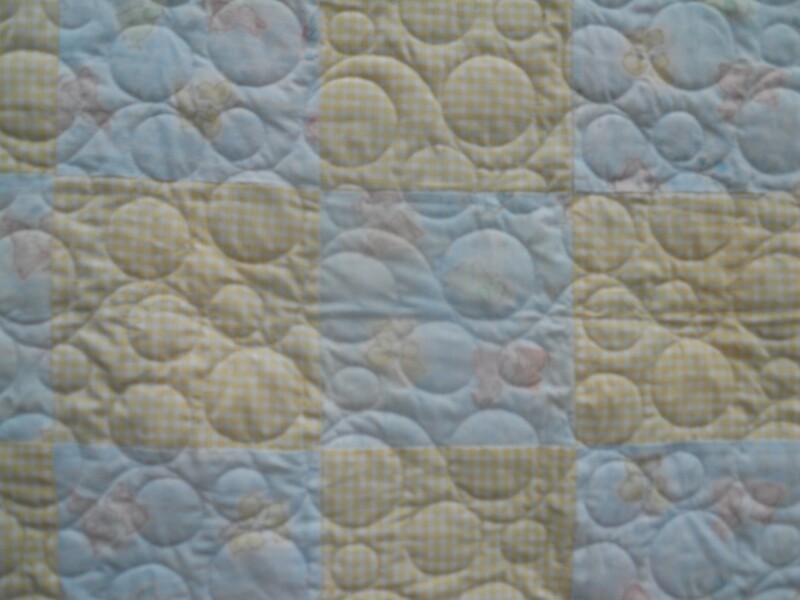 What a fun texture this Double Bubble quilting pattern is. A kid’s print was used on the back. Thanks to the member that made the labels and put them at the Hen House! Welcome to our last Scrap Saturday for now. It’s time to get excited about the 2018 Spring Tea! Click on the 2018 Spring Tea tab at the top of this page for all the details. Tickets are already being sold. Reserve your spot now. 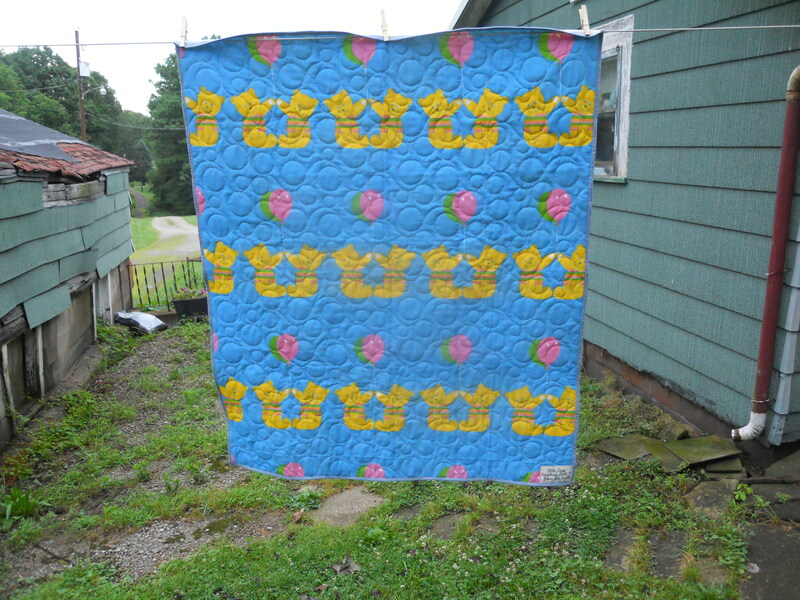 This quilt is called Pineapple Crazy. It was made by Bonnie Hunter. She amazed the group at the 2017 Spring Tea with it. The pattern can be found in Bonnie’s book, String Fling. 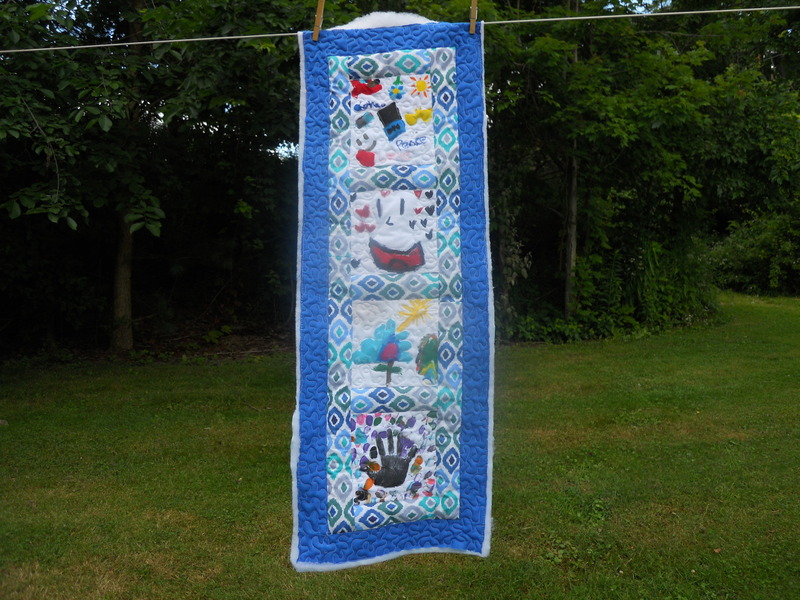 This Big Basket Charity Quilt was completed today (all except the label.) 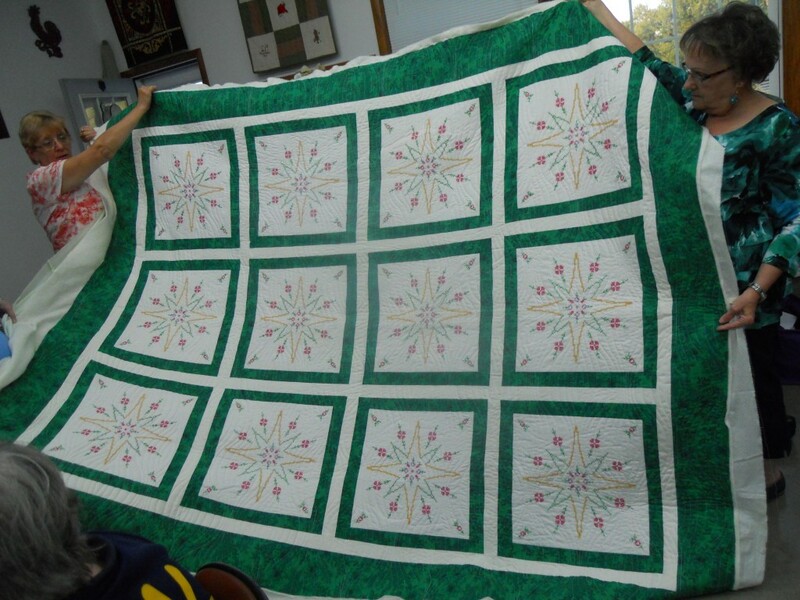 This quilt measures 100.5″ wide by 93.5″ long. Here’s the simple pieced back that used up a few odds and ends fabric. 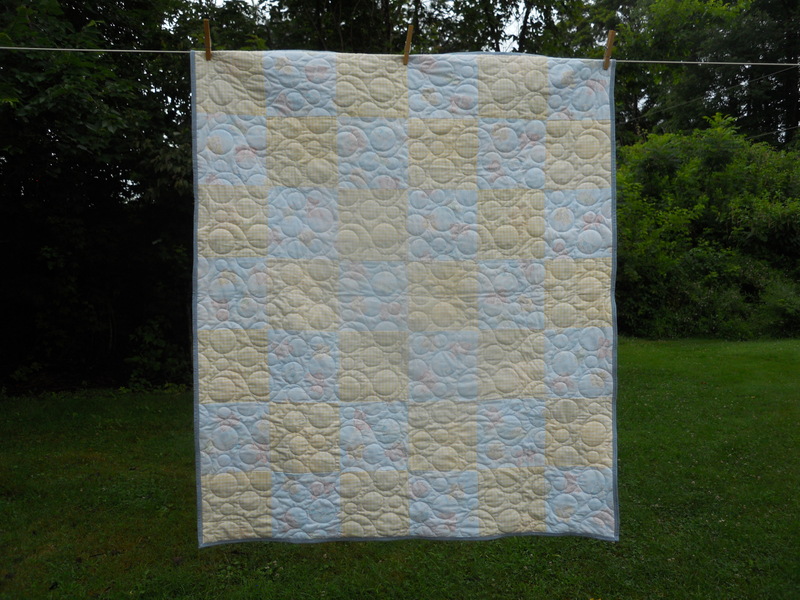 The polyester batting really shows off the grooves in the quilting. 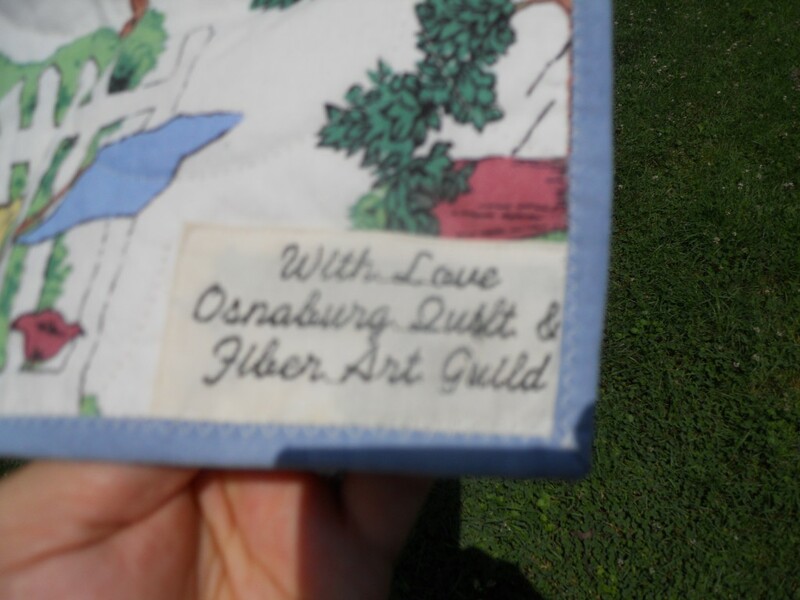 It will be a fine charity quilt. 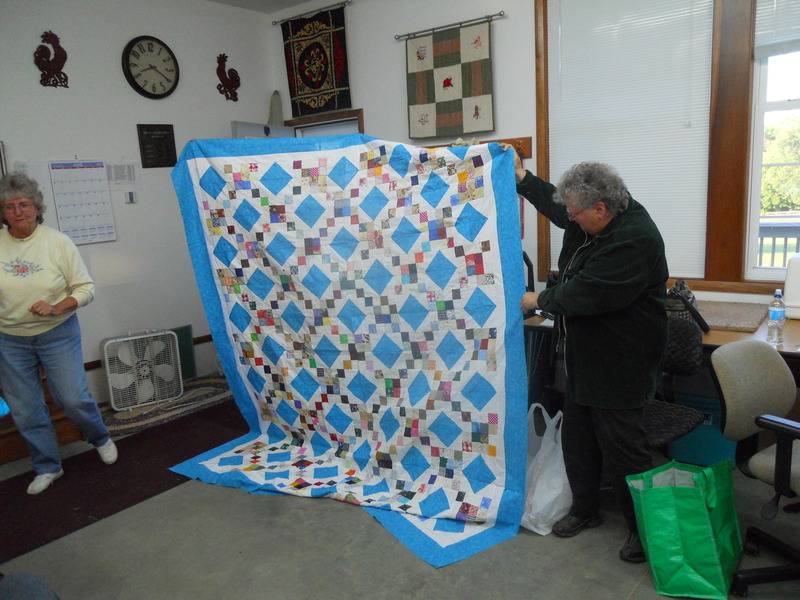 Dave Lewis and Charlene McCook hold a McCook family themed quilt in the above photo (taken from The Free Press Standard). 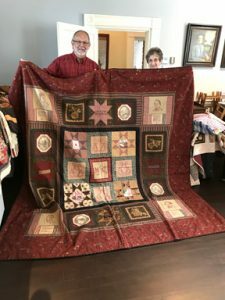 A quilt exhibit of more than 50 Civil War era quilts will be on display through July at the McCook House Civil War Museum. The McCook House is located in the top Public Square in Carrollton. The Osnaburg Quilt and Fiber Arts Guild will be going on a field trip to see Color My World with Quilts. 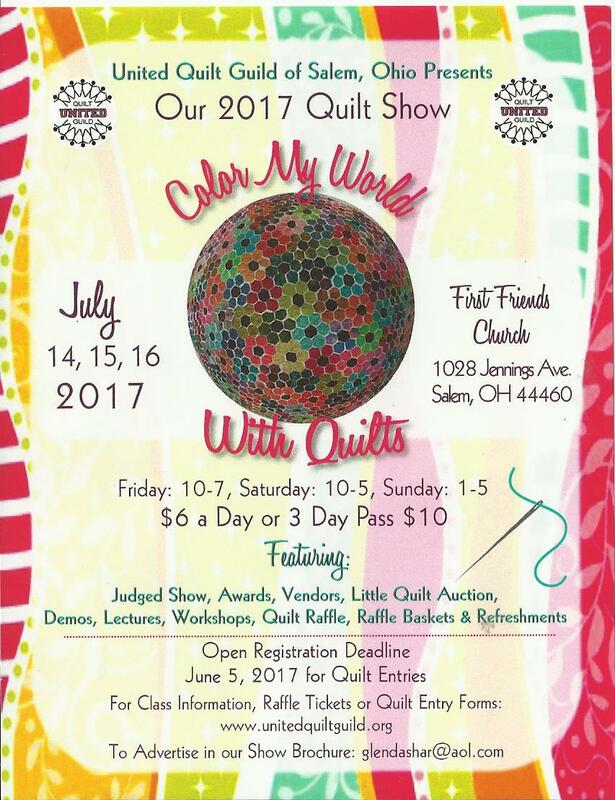 The quilt show is being presented by United Quilt Guild of Salem on July 15, 2017. Meet at the Hen House at 9:30AM if you would like to car pool. There’s a super fun modern trunk show at 11AM and an upbeat motivational speaker at 1PM on Saturday. Don’t miss the bus! 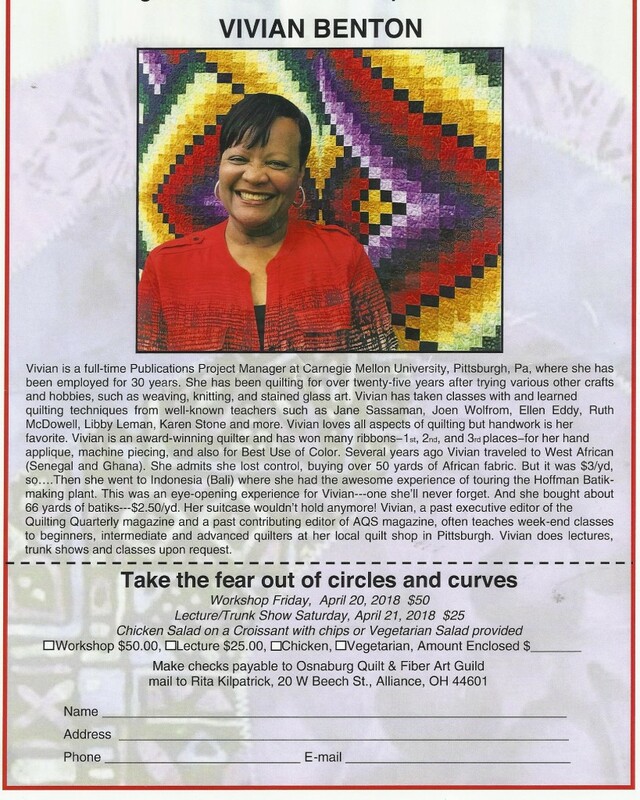 The quilt show will be held in First Friends Church; 1028 Jennings Ave.; Salem, OH 44460. Click on the photo for more info. 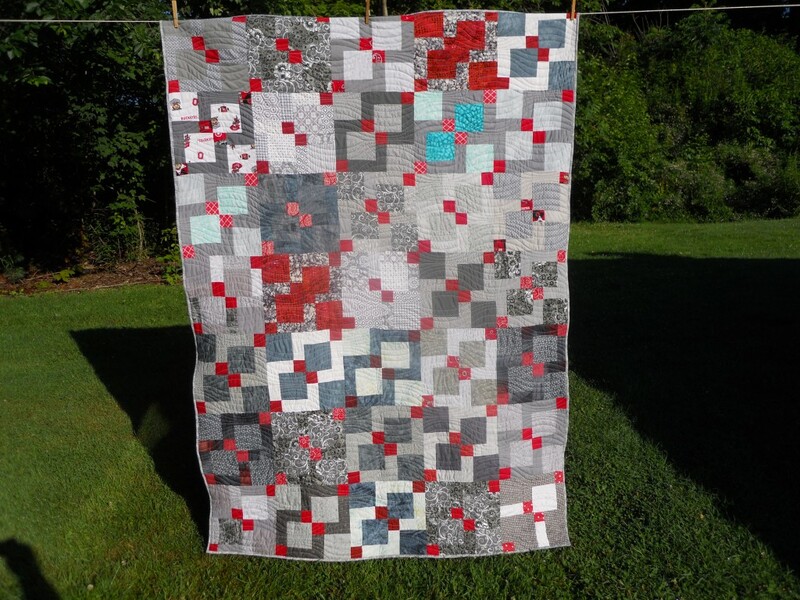 Flo’s Challenge quilt — Louise won! Congrats! Blocks nicely set on point. 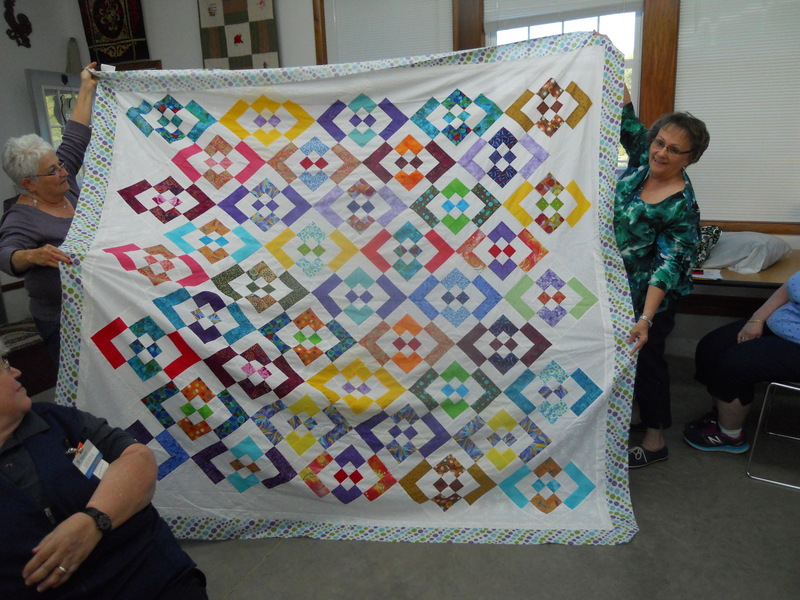 Louise’s Fiesta kit quilt. Aren’t these colors beautiful? 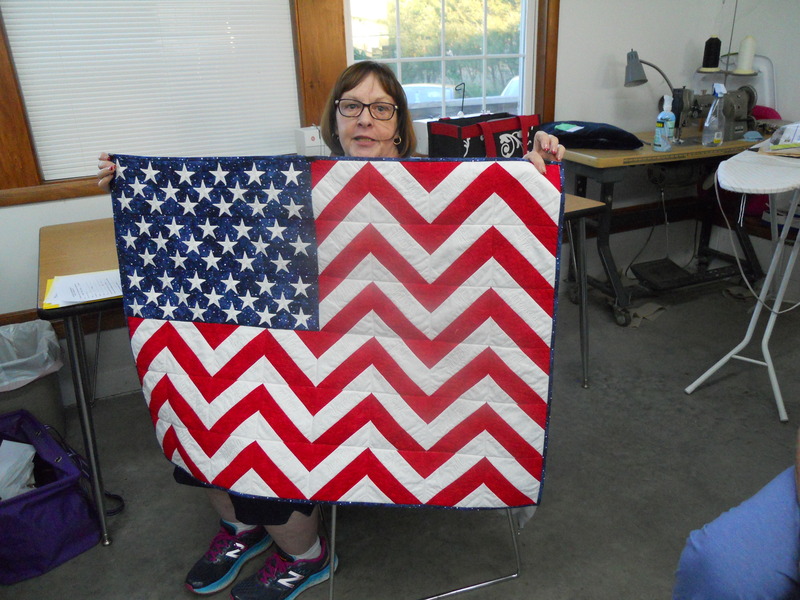 Beth’s fun Independence Day quilt — embroidered in the white areas are the words to the Pledge of Allegiance! Awesome, Beth! 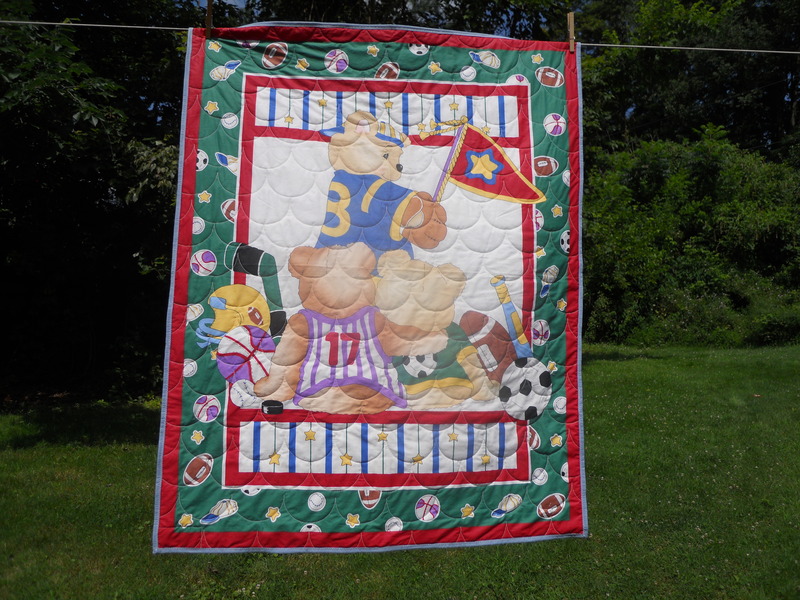 Another patriotic quilt by Beth. What fun borders! 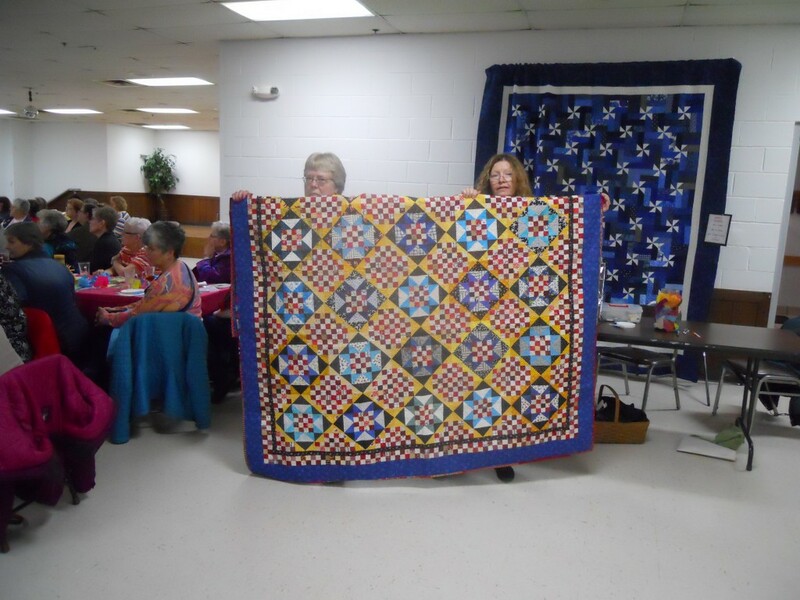 Sylvia’s D9P quilt that she made blocks from the 2016 Christmas D9P swap. 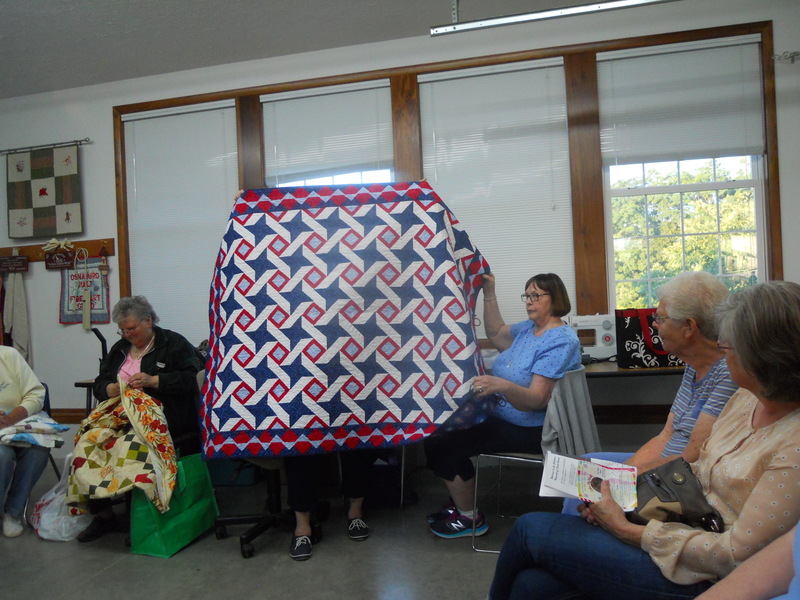 She quilted it herself at the Hen House! 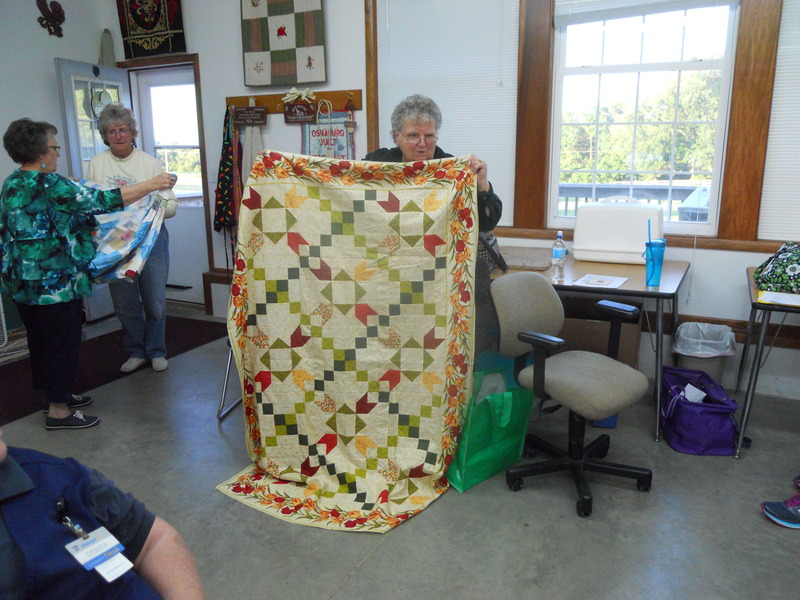 Sandy’s beautiful sampler quilt in Civil War reproduction fabrics. 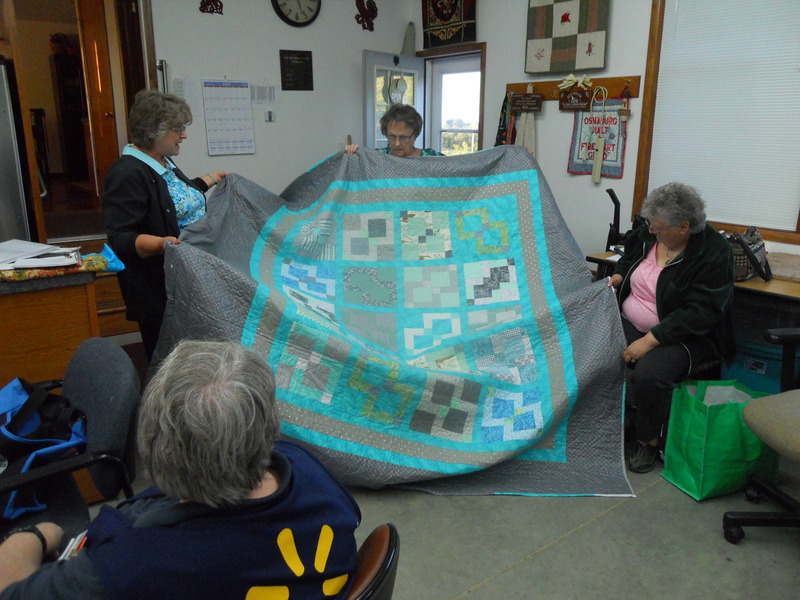 This was a block-of-the month quilt from AnnaLouisa’s Quilt Shop in Louisville. Rita’s fun fabric that she found. She is quilting the design on it and then painting the color on it. It will be a jacket. Can’t wait to see that! 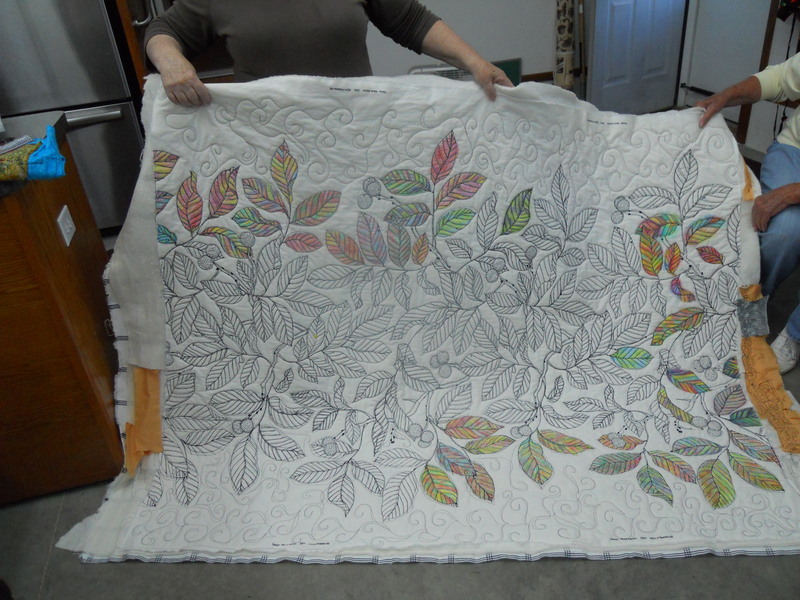 Sue’s embroidered quilt. She carried these blocks around in Ziploc bags when the kids were young. 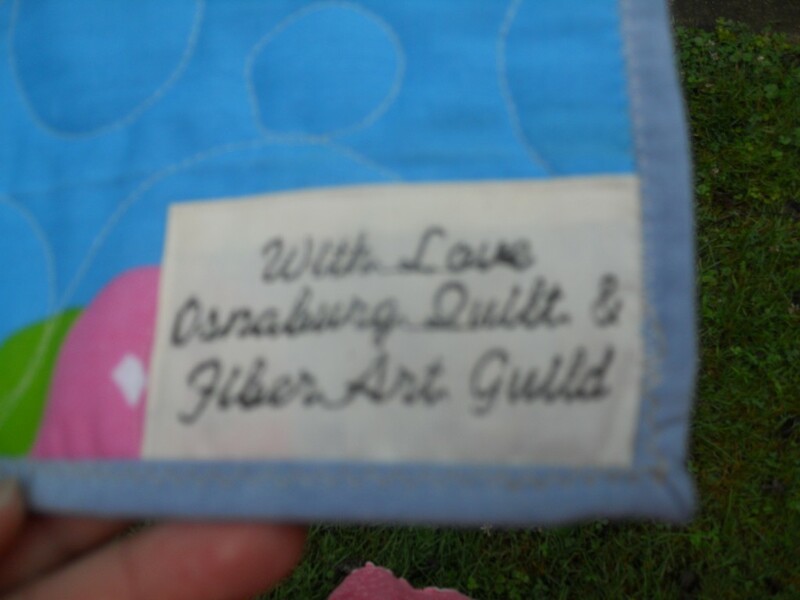 Now she’s putting them together in quilts. Rita’s truck. Isn’t it artsy? Kathy’s D9P from the 2016 Christmas block swap. 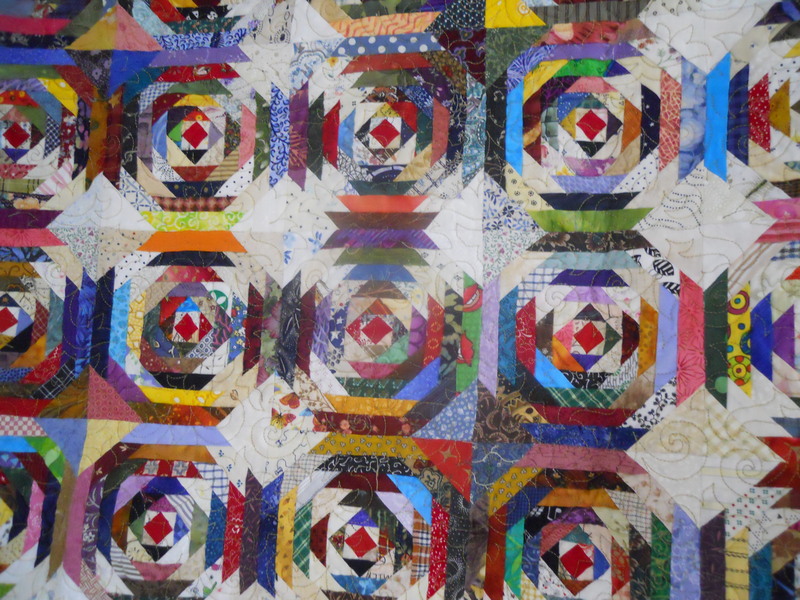 It looks a lot different without the sashing and cornerstones that Sylvia did, but it’s the same block. Diane’s banner that will be hanging at The Children’s Network in Canton. 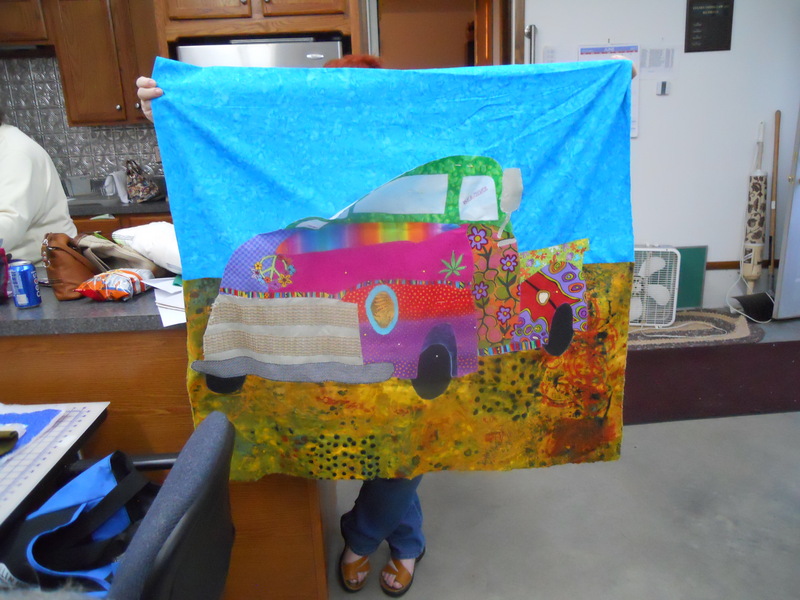 Sue’s banner that will also be displayed at The Children’s Network in Canton. Tickets are already being sold for the Vivian Benton workshop on Friday, April 20, 2018! The class is titled “Take the Fear Out of Circles and Arcs.” It will be held at St. Paul’s Lutheran Church; 3295 S. Union Ave., Alliance, OH. Contact Rita Kilpatrick at (330) 257-8158 for tickets. You may also e-mail her at quiltersalliance@yahoo.com. Please note that the ticket in the photo above is not valid for class. You need to purchase a ticket with a number on it from Rita. Welcome to Scrap Saturday. 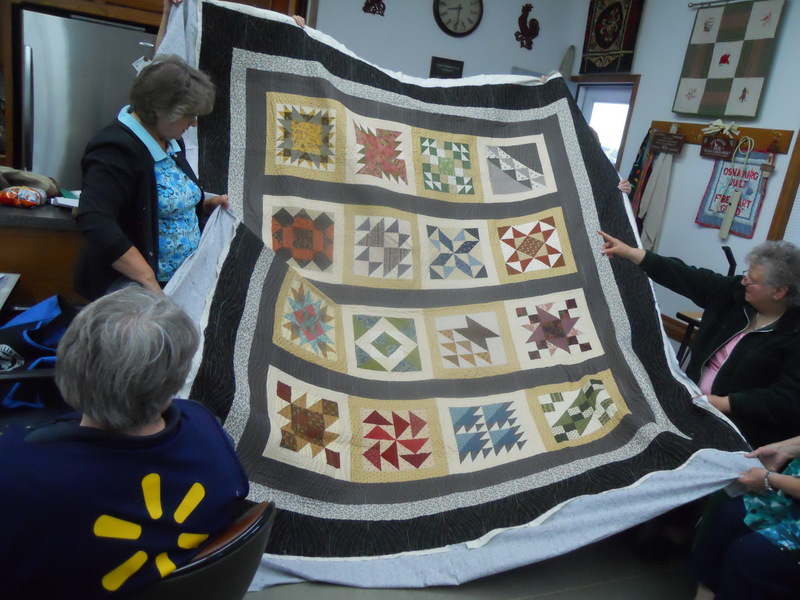 Today we are featuring the quilt that Bonnie Hunter calls Winston Ways. It was part of her trunk show in March, 2017. 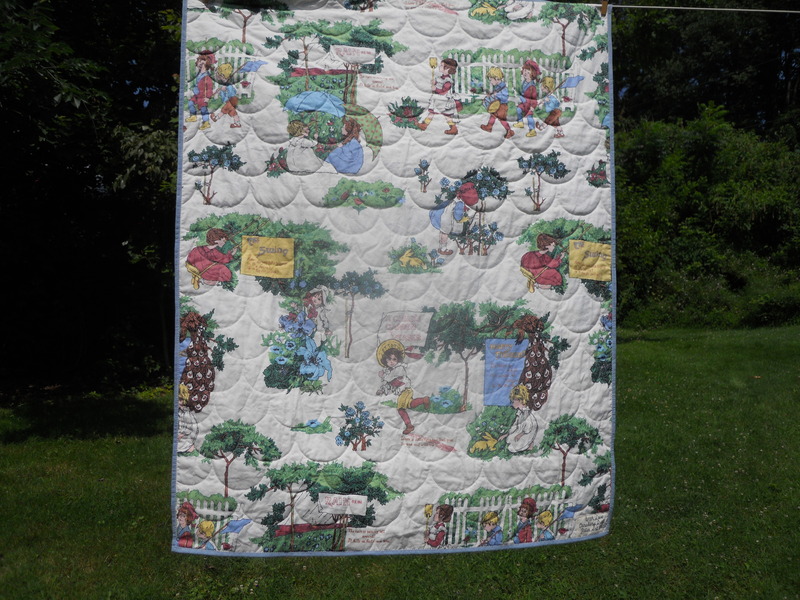 The pattern for this quilt can be found in Bonnie’s book, More Adventures With Leaders & Enders.